With the streets of Portland still recovering from the ice storm of 2017 and this year's late freezes, this summer, PBOT will invest $105 million into street repair capital projects. Fixing Our Streets projects make up approximately 20 percent of the investments in Portland's transportation infrastructure this construction season. The Portland Bureau of Transportation broke ground on March 27 on the first of 19 paving projects it has planned for this summer. Southeast 50th Avenue between Hawthorne and Division is the first of these Fixing Our Streets projects planned for the 2018 summer construction season. The 19 projects range from a $200,000 Neighborhood Greenway along Southwest and Northwest 20th to a $3.5 million paving project along Southwest Vermont Street from Southwest Oleson Road to Southwest Capitol Highway. In total, approximately $20 million in Fixing Our Streets projects will begin construction in the next six months. The $1.1 million project along 50th will pave the street, update corners with ADA ramps to prevent further pavement deterioration and improve overall street accessibility. Work along Southeast 50th Avenue will require intermittent lane and sidewalk closures as workers begin curb ramp construction on the 26 street corners slated for ADA curb ramp upgrades through late May, before requiring additional lane closures and detours for paving work in June. Completion here is slated for June. 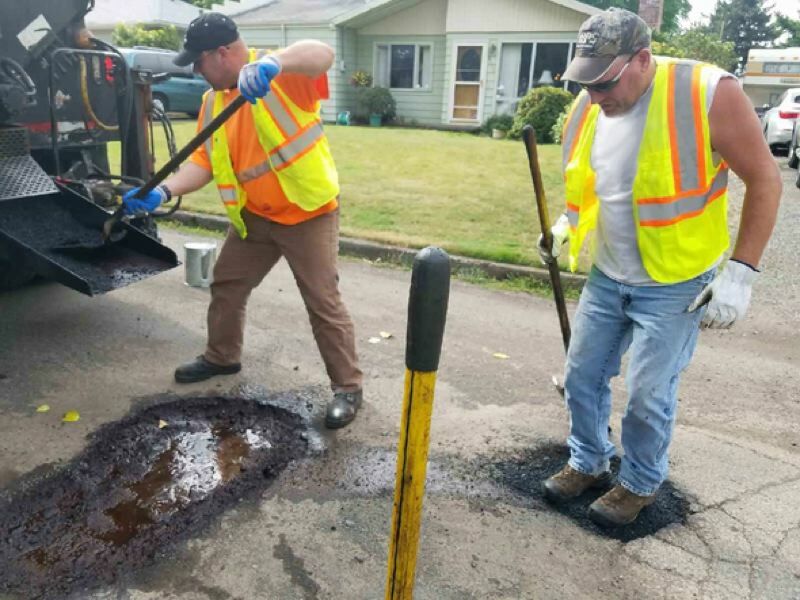 PBOT placed extra workers on pothole-patching duty to work through the backlog of more than 500 reports submitted every day by Portlanders. For two weeks in March, PBOT assigned nine crews to focus on repairing potholes on city streets — up from the two crews assigned to potholes on a normal day. Workers who typically would be re-paving roads, patching utility cuts or other preventive maintenance were spreading hot asphalt instead. Crews filled almost 1,445 potholes at more than 350 locations, and the number of pending pothole requests from the public dropped from 297 to 51 as crews responded to reports. Since Jan. 1, PBOT crews have filled more than 4,500 potholes. Last year, PBOT crews filled more than 15,000 potholes, nearly double the average of 8,000 potholes filled in a typical year. Potholes are a symptom of a failing street. They can be prevented with regular maintenance that keeps the pavement in fair condition, which is the larger goal of the Fixing Our Streets program. Fixing Our Streets is the result of the passage of Measure 26-173, a 10-cent tax on motor vehicle fuels and Portland's first local funding source dedicated to street repair and traffic safety projects. Passed on May 17, 2016, Measure 26-173 will raise an estimated $64 million over four years. PBOT is investing this money in a wide variety of street improvement and safety projects across the city — and Fixing Our Streets take preventative measures against potholes and disrepair. The Fixing Our Streets program is Portland's first street repair and traffic safety program financed with local funding. 56 percent of Fixing Our Streets funding is invested in street maintenance and 44 percent is invested in safety improvements. The City Council ordinance included a project list that shows specific projects that are intended to be funded.